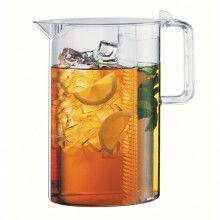 The Bodum Jumbo Ceylon 3.0 liter Iced Tea Jug is great for all occasions, during hot summers as well as cold winters! Made of see-through BPA-free plastic, the Ceylon makes brewing iced tea simple and easy. Bodum has been producing the Ceylon Iced Tea Maker for years in a 1.5 l, 51 oz capacity. After requests from consumers for a larger size version we are happy to launch this new 3.0 l, 102 oz version offering twice the capacity of our original Ceylon. The ease of use is the same, now you just get more of your favorite iced tea. The Ceylon allows you to easily make delicious, natural iced tea, giving you the freedom of choosing favorite ingredients. Simply add your preferred tea leaves into the removable filter and fill it half way with hot water. Allow the tea to brew to your liking and then remove the filter to stop the brewing process. Fill the rest of the pitcher with ice and after just one minute you are ready to serve fresh iced tea. In addition to iced tea, the Ceylon can be used for all kinds of delicious infused drinks like orange juice with mint leaves, sangria with lots of fruit slices or ice water with cucumber or lime slices. The filter system is removable allowing the Ceylon to double as a nice pitcher. The lid includes a screening filter to help prevent particulates from flowing into your cup. For best results we recommend hand washing the Ceylon Ice Tea Makers. Instructions and recipe suggestions included. The oval design helps this pitcher to fit easily in the refrigerator. Made in Poland. Click the button below to add the Bodum Ceylon 102 Ounces Iced Tea Maker and Water Infuser to your wish list.